What is The Point of "Think" by John Piper? My morning perusal of all my favorite twitter friends led me to an article about Piper's new book "Think." After the initial shock of the realization that I needed to add yet ANOTHER Piper book to my list of "to-read," I am thoroughly excited about the questions confronted in this book and the honest replies that point to Scripture alone. Read it here: What is The Point of "Think" by John Piper?. Read this article posted on The Gospel Coalition website by Dane Ortlund. It hits exactly on what has been on my mind so much lately - war, peace, and Germany in the mid 1900s. It also reminds me of C.S. Lewis and his writing on living as a civilian during wartime, as opposed to a soldier. All interesting thoughts... what are yours? What could Bonhoeffer possibly have in common with baked cookies and isn't the Bible a bit of a stretch? Well, for starters - the letter B! If you are still puzzled, let me explain. Bonhoeffer Lately, I have been reading the biography of Dietrich Bonhoeffer by Eric Metaxas. I first read Amazing Grace by Metaxas and, by the end, felt I had walked alongside William Wilberforce as he painstakingly claimed ground for abolition of the slave trade. When I heard he'd written on Bonhoeffer (Cost of Discipleship and Life Together), I couldn't be more excited to know more about the life of the man who was a scholar, pastor, theologian, spy, and conspirator. I love it. I can hardly put it down. What I keep finding so amazing is the way the Lord allowed this willing servant to understand so much and be rejected so often, yet remain determined to preach Truth without fear. 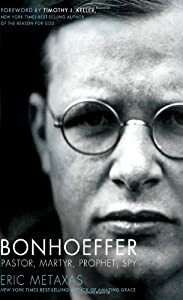 To read some of Bonhoeffer's sermons, written on the brink of Hitler's propaganda-run takeover of Germany, you would be convinced the man had insider information. His background as a scholar and a pastor allowed for his pragmatic presentation of the Gospel Truth (to everyone from impoverished confirmation class ruffians to some of the most influential leaders of the Third Reich), while his pleasant demeanor made it difficult for anyone to find fault with him. Not unlike many of the Old Testament prophets, Bonhoeffer really was a lone voice crying out against the injustices of a nation and pointing to the Truth that exposed it. Also, like many OT prophets, he was rejected by the people. My favorite part is the way God used the people's rejection to allow for a Confessing Church to emerge and doggedly fight in the midst of a monster that was Nazi Germany from the inside. Baked cookies Fresh-baked cookies are infamous for their mesmerizing effect on a person. Most notably as of late, is the effect they have on my students when I bake and bring them to school. No matter what the occasion, at the sight of anything carried in tupperware, a crowd instantly appears (all of whom have not had anything to eat in days). The strangest thing is, after several periods, the very same students who devoured the freshly-baked goods are back snooping around my office for more of the same treatment. Bible Study Tonight was the first night two friends and I met for a Bible study (which, in itself is extremely exciting for me to be engaging with peers). As we worked through the first couple lessons in Beth Moore's study of David, I realized how much I missed reading the Word in community. I recently watched a John Piper sermon called "The Sinful Origin of the Son of Man" and I am so thankful for the way it prepared me to see Israel's demand for a king as sin, but God's mysterious ways of revealing Himself (even choosing to reveal Himself) by way of man's "great wickedness." After God calls Samuel out of his grieving to go and appoint a new king, and after Samuel obeys but assumes wrongly the next king would look the king's part, and after Samuel finally waits for the "okay" to appoint the most unlikely of candidates... we realize that the heart God has found to be "blameless" (ESV), "completely His" (NASV), and "loyal" (NKJV) is a heart that will soon have the weight of a nation on its shepherd shoulders. What blows my mind is that when God searches the earth and finds hearts that are "fully committed" (NIV) to Him, it does not result in a first class ticket to heaven or a get out of jail free card or a receive a life of rest and relaxation pass. God finds those hearts and then gives great responsibility and even allows great burden in their lives. God promises to strengthen, encourage and hold up these hearts. If we are faithful in our full commitment, God will be faithful in equipping and strengthening us for the great tasks that lay ahead. Bottom line (totally unintentional use of the letter B here) We (humans) have an appetite. Bonhoeffer's appetite for Truth led him to a deep love of God and a deep conviction for Truth to be preached without shame or censor. Our insatiable appetite for cookies reveals our deeper desire to be FILLED with something that does satisfy. Bible study is what APPETITE is all about. We are meant to be FILLED with the Word - the Bread of Life. The more we eat, the hungrier we are. That's the beauty of Truth... it is at the same time the most filling and the most appetizing thing we'll ever taste. Mmmm... this Tuesday is tasting SO GOOD!